Begin your vacation in Sydney, Australia's oldest city, the economic powerhouse of the nation and the country's capital in everything but name. Sydney is blessed with sun-drenched natural attractions, dizzy skyscrapers, delicious and daring restaurants, superb shopping and friendly folk. Choose from the many optional tours that are available. Next fly North to Cairns. Cairns is a modern, sophisticated city, offering access to World Heritage-listed Great Barrier Reef and islands, rainforests and the Australia Outback. Cairns presents a comfortable blend of traditional and modern designs. Day trips can be included to the Great Barrier Reef, Kuranda and Rainforest allowing you to fully appreciate this fantastic part of Australia. Arrive in Brisbane, a city which was once described a big country town has now emerged as one of the country's most progressive centres. Brisbane has several fascinating districts, a good street cafe scene, a great riverside park, a busy cultural calendar and a thriving nightlife. Nearby you can see many different types of unique Australian animals and reptiles at Australia Zoo. 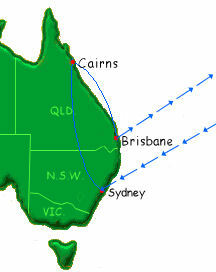 Your next stop in Australia is Cairns, located in tropical North Queensland. Known as the gateway to the Great Barrier Reef and the Daintree Rainforest, Cairns is a city alive with life and charm. Here, warm northern hospitality and enthusiasm are the order of the day. Tour the Great Barrier Reef with its opportunities to snorkel and swim. Experience the lush green ferns and waterfalls in the heritage listed Daintree Rainforest. Explore Cape Tribulation and the cruise the Daintree River. Experience authentic aboriginal culture with a tour to Tjapukai Aboriginal Cultural Park. Finally, visit Sydney, Australia's oldest city, the economic powerhouse of the nation and the country's capital in everything but name. Sydney is blessed with sun-drenched natural attractions, dizzy skyscrapers, delicious and daring restaurants, superb shopping and friendly folk. Maybe cruise the Sydney Harbour, tour the Opera house and for the adventurous, climb the Sydney Harbour Bridge. Next head deep into the Outback. Alice Springs is Australia's most inland town, sitting around 200km south of the absolute centre of the continent. 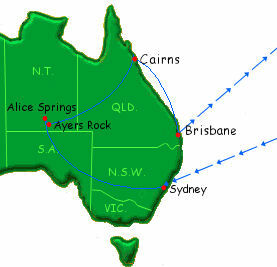 Alice Springs was established, under the original name of Stewart, as a telegraph station - linking Adelaide and Darwin. A century later, it is still a communications and commerce hub, and is now home to a population of approximately 28,000 people. Ayers Rock has acquired its reputation not just, because it is such a unique landform, but also because of the effect, the sun has on its colours and appearance. Sunrises and Sunsets cause changes to its colour from browns though oranges, reds to finally grey. The best colour effects occur on overcast days. Additionally the sun casts shadows off the larger and smaller gaps on the rock face, which incredibly changes its look almost by the minute. Cairns is a modern, sophisticated city, offering access to World Heritage-listed Great Barrier Reef and islands, rainforests and the Australia Outback. Cairns presents a comfortable blend of traditional and modern designs. Stroll past the boutique shops, dine al fresco at an award-winning restaurant, cafe or bar or be inspired at a cultural centre or art gallery. Please select from the optional Day Tours offered. Sydney is Australia's oldest city, the economic powerhouse of the nation and the country's capital in everything but name. Sydney is blessed with sun-drenched natural attractions, dizzy skyscrapers, delicious and daring restaurants, superb shopping and friendly folk. Bursting with character, Sydney is a vibrant city catering to all your desires whether you seek exhilaration and exploration or 100% relaxation. Select from the Optional Day Tours. 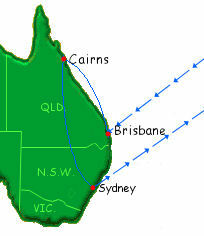 Next head north to an island on the Great Barrier Reef. The Island is a true coral cay right on the World Heritage Listed Great Barrier Reef. Here you can swim straight off the beach to an endless garden of coral where the waters are literally teeming with beautifully coloured fish and marine life. Situated on a 10,000 acre working cattle station in the Scenic Rim of South East Queensland country just an hour's drive from Brisbane and the Gold Coast, the farm stay offers an exclusive Outback Australian accommodation getaway. SE Queensland Country offers boutique hotel accommodation centered around the historic homestead, and for those seeking a distinctive country experience, you can escape the luxury by camping accommodation in one of the overnight cabins as part of our 4WD and horse riding tours. The Rainforest Resort is located in World Heritage Lamington National Park, 2 hours by road south of Brisbane and 1 1/2 hours by road west of the Gold Coast. Lamington National Park is home to a vast array of unique flora and fauna. Pademelons, gliders and possums, frogs and the amazing array of birdlife makes the retreat a nature lover’s paradise. This lush tropical rainforest retreat is 930 meters (3,000 feet) above sea level, enjoys cool mountain air (for cooler days and nights in summer), and has spectacular views, which go forever.